Advanced Pavement Marking® - We are more than just line stripers! More than just line stripers! 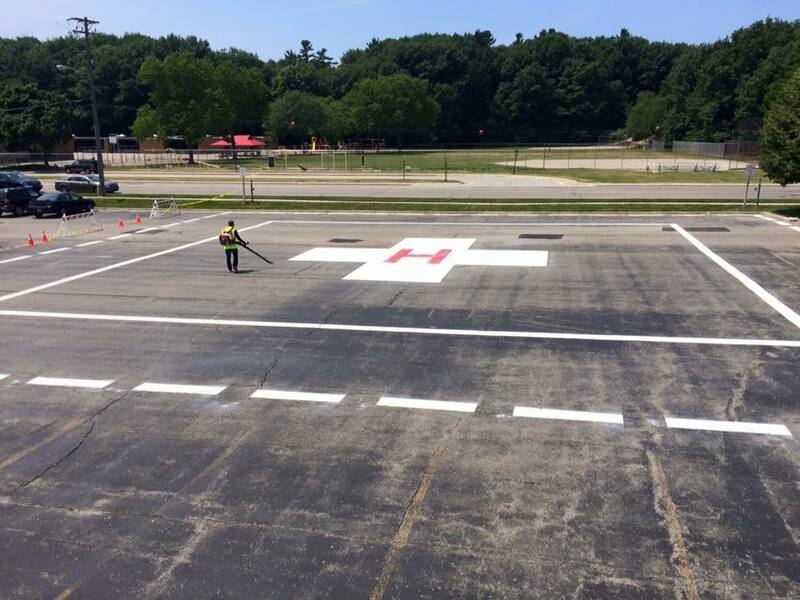 APM is well known for our road, airport and racetrack painting services. Did you know we are also committed to giving back to communities and charities. From financial support, labor, materials donations and more we are here to help make a better world! Helping people and leaving a “positive mark” that’s our commitment for a better world. 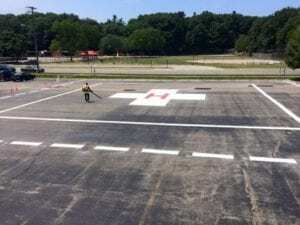 Advanced Pavement Marking donated labor, materials and equipment to North Ottawa Community Hospital servicing the emergency helicopter pad. Past markings were very dull and faded, also missing was retro-reflectivity for increased low light visibility crucial for pilots awareness and safety. Advanced Pavement Marking and it’s family members are very active in various forms of sports. 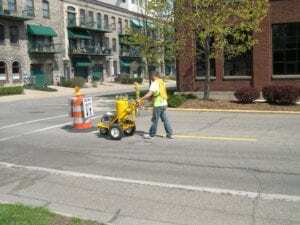 When there is an event that combines our passion along with a way to give back to a worthy cause, chances are an Advanced Pavement Marking crew member or family member gets involved. Advanced Pavement Marking owners’ wife Donna committed to doing the MS 100 ride and we helped support her and her financial contribution goals. Donna placed in the Top 100 for donations! 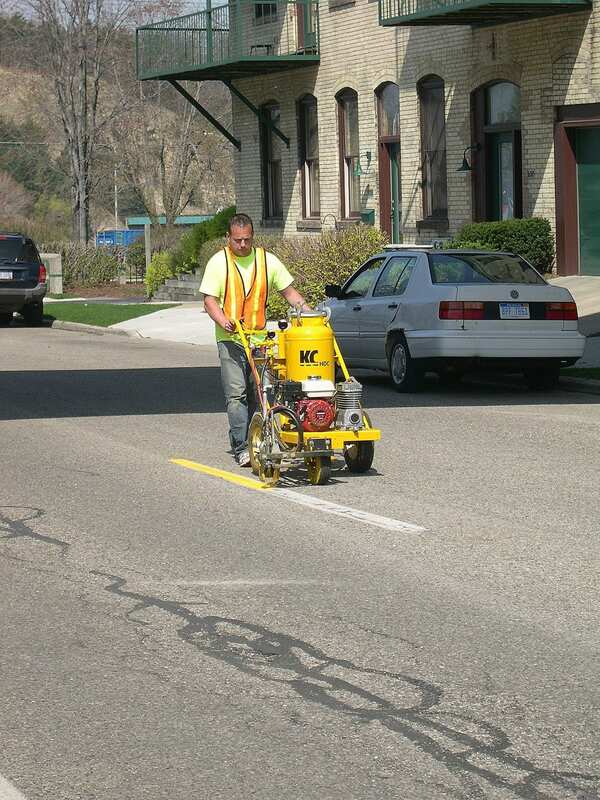 Going beyond the parking lot stripes and road markings we lead by example on and off the pavement marking industry. 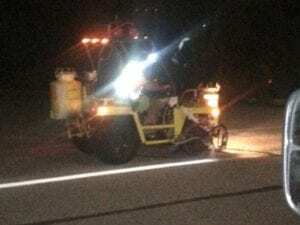 This disease has affected a Advanced Pavement Marking crew member’s father. When we found out a person was looking for a donation sponsor to help her on the “step out” APM proudly stepped in to help her meet the goal. As a father and avid bike rider Advanced Pavement Markings owner Don Sokolow along with his wife Donna committed to joining in on this event and contributing to this cause. Columbus street in Grand Haven, MI was under construction, this street was converted from a one way traffic pattern to a two way pattern. Center line markings needed to be converted from (White) the designated color for one way traffic, to (Yellow) the designated color for two way traffic flow. This color change was an item overlooked in planning and was not accounted for. APM donated time & material for correcting this and to aid with City obligations to adhere to established traffic codes. This stretch of road changed colors and traffic patterns 3 times, APM was counted on to ensure the markings were properly serviced. 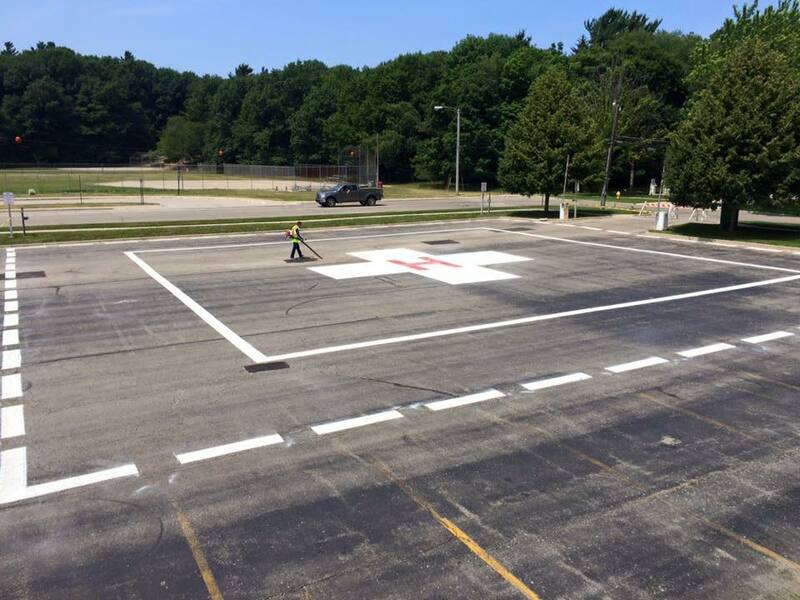 From center lines, airport markings to parking lot stripes our work is done by passionate craftsmen and women. Not all our donations support charity some help with community and public safety, At APM we lead by example! When other line stripers are only concerned about making quick money our first concern is peoples safety. We do our best at making a positive impact any way we can. This commitment and dedication places us far ahead of other line stripers. Holland Charter Township wanted crosswalks to not only provide safe crossing locations but also be more visible. 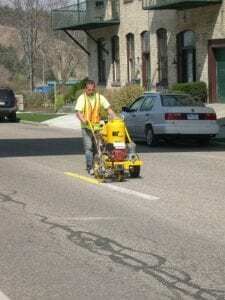 APM was contracted for marking all of the Townships crosswalks. 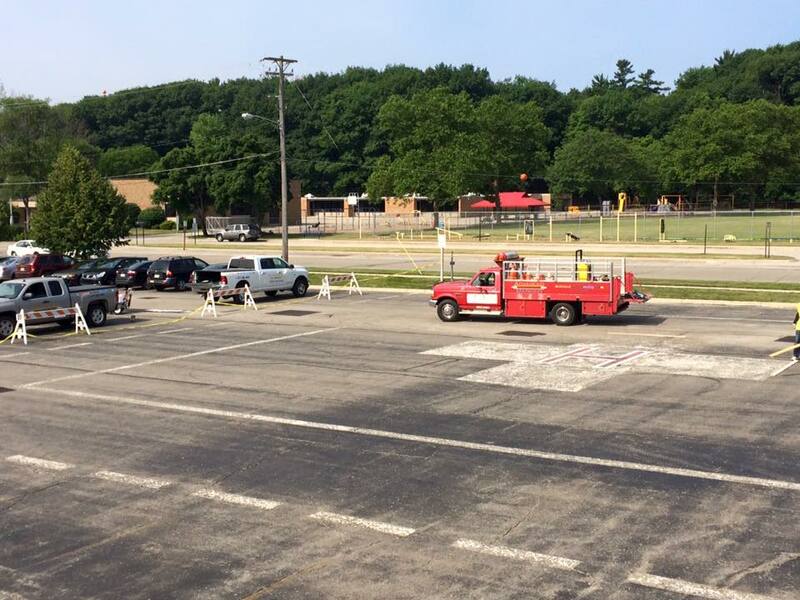 Once our crews commenced with this project it was identified that crosswalks needed reflective media to make crosswalks in busy intersections and near Schools more visible. The Townships budget did not have funds for adding reflective materials. 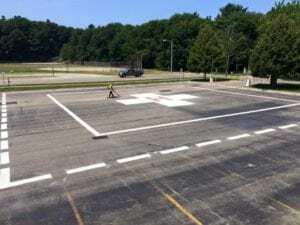 To help increase safety and crosswalk awareness Advanced Pavement Markings donated several thousand pounds of reflective media to the entire Holland Charter Township crosswalks. Camp Blodgett is located off Lakeshore Dr. in West Olive, Michigan. The road in which this camp sits on has a speed limit of 55mph along with limited visibility in areas. Campers and staff members were seeking a safe crossing route that could provide visible awareness to oncoming traffic and also give a specific location for pedestrians to cross the road. With limited funds and the need for this important crossing, the Team at APM donated labor and materials to help get this crosswalk installed for the camp. 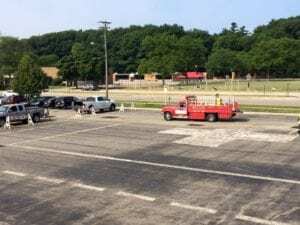 Advanced Pavement Markings owner joined with the Spring Lake Aquatic center for this health awareness event. Don’s father past away due to heart disease so this event really has a personal meaning for him. Teams of eight cyclists ride bikes mounted on trainers for 25-minute intervals and compete for team trophies and individual medals. We are more than line stripers!